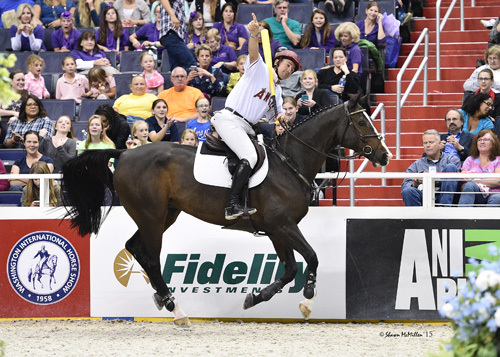 WASHINGTON, October 23, 2015 – The 2015 Washington International Horse Show (WIHS) hosted its third day of equestrian competition at Verizon Center in downtown Washington, D.C. on Thursday. 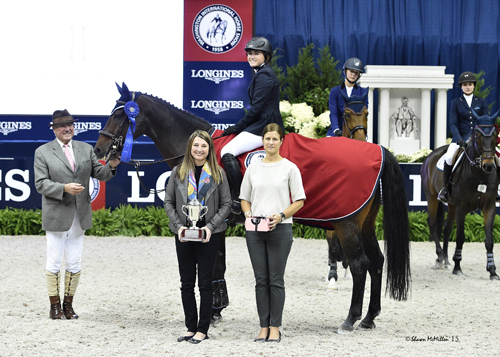 The youngest rider in this year’s international show jumping competition at 18 years of age, USA’s Victoria Colvin jumped to victory with Cafino in the $35,000 International Jumper Welcome Stake. Top honors in the $20,000 Gambler’s Choice costume class, presented by the Winter Equestrian Festival, went to McLain Ward (USA) and HH Ashley. The Junior/Amateur-Owner Jumpers also competed Thursday with wins for Taegan Long and Pollux de Shalimar in the Low division, sponsored by The Strauss Family, and Madison Goetzmann and Wrigley in the High division, sponsored by Staysail Farm. The Junior Hunters hosted the first day of classes for their divisions in the morning and will conclude on Friday. Competition continues through Sunday, October 25, with much more exciting action throughout the weekend. Victoria Colvin and Cafino. © Shawn McMillen Photography. 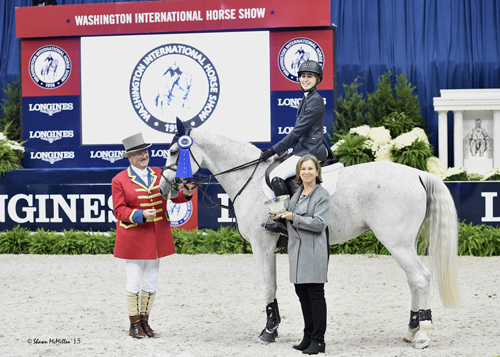 Victoria Colvin and Cafino in their winning presentation with ringmaster John Franzreb, WIHS President Victoria Lowell, and WIHS Executive Director Bridget Love Meehan. © Shawn McMillen Photography. McLain Ward and HH Ashley. © Shawn McMillen Photography. Aaron Vale and Quidams Good Luck. © Shawn McMillen Photography. 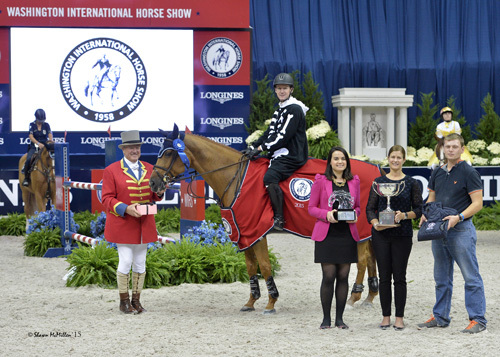 McLain Ward and HH Ashley in their winning presentation with ringmaster John Franzreb, WIHS Marketing & Communications Director Nara de Sá Guimarães, WIHS Executive Director Bridget Love Meehan, and HH Ashley’s groom. © Shawn McMillen Photography. The $2,500 Low Junior/Amateur-Owner Jumper speed class, sponsored by The Strauss Family, was held on Thursday afternoon with 24 entries and a wire-to-wire win for 16-year-old Taegan Long of Bedford, NJ, riding Maria Long’s Pollux de Shalimar. 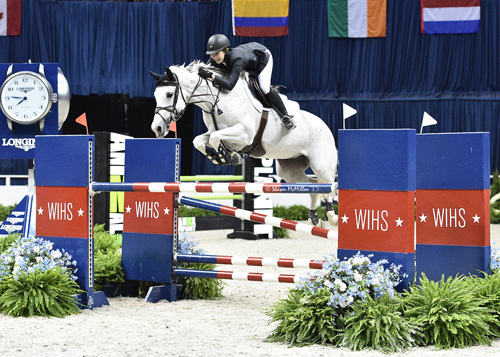 Long was the winner of the 2014 WIHS Children’s Jumper Championship and had the daunting task of going first in the order of her first Low Junior/Amateur-Owner competition at WIHS. She clocked an unbeatable clear round in 51.47 seconds to earn top prize and the Beagle Brook Farm Perpetual Trophy. Sima Morgello and Double S Farm LLC’s Zopala finished second in 53.16 seconds. Sheer Levitin and Nabuco jumped into third in 53.30 seconds. Taegan Long and Pollux de Shalimar. © Shawn McMillen Photography. Taegan Long and Pollux de Shalimar in their winning presentation with ringmaster John Franzreb and Beth Strauss. © Shawn McMillen Photography. Long’s win last year was with Pocohontas, who she also jumped in Thursday’s class, but the win came with Pollux de Shalimar, a 12-year-old Dutch Warmblood gelding. Madison Goetzmann and Wrigley. © Shawn McMillen Photography. Out of 24 entries, only three were able to clear the course without fault. Anna Dryden and Petrushka III set the pace in 59.50 seconds to eventually finish second. Goetzmann was next to contest the track with Wrigley and clocked the winning time of 58.27 seconds. Lucy Deslauriers took third place honors with her time of 60.79 seconds riding Hamlet. Goetzmann leased Wrigley, a 12-year-old Dutch Warmblood mare (by Padinus), from trainer John Madden during the past winter in Wellington, FL, and then purchased the mare soon after. They have been together for almost a year now. Madison Goetzmann and Wrigley in their winning presentation with ringmaster John Franzreb and Elizabeth Miller for Staysail Farm. © Shawn McMillen Photography. 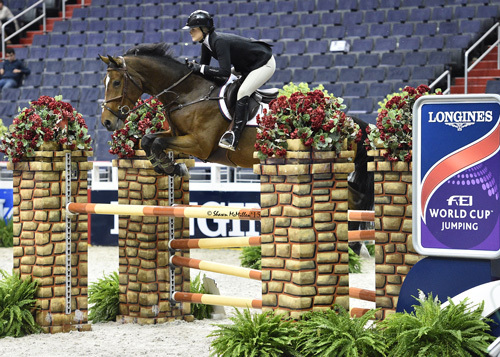 This was Goetzmann’s first time doing the High Junior Jumpers at WIHS. She competed in the low division two years ago and was excited to get a win at the next level. 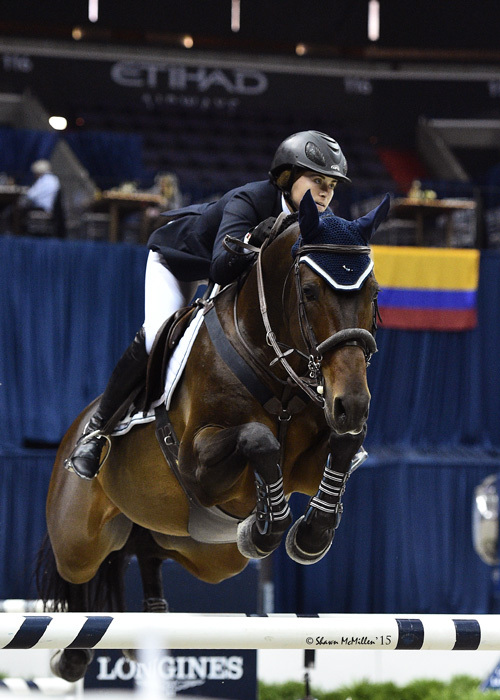 Goetzmann will also be competing in the WIHS Equitation Finals this weekend. Next year, she hopes to do some young rider and under 25 show jumping events throughout the season. 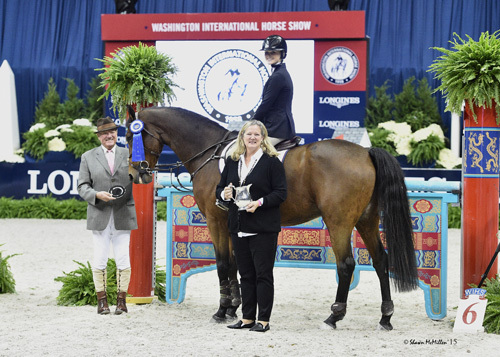 The Washington International Horse Show continues on Friday with the championships for the Junior Hunter divisions as well as the hunter phase of the WIHS Equitation Finals, presented by SAP. The Low and High Junior/Amateur-Owner Jumpers will have jump-off classes in the afternoon session. 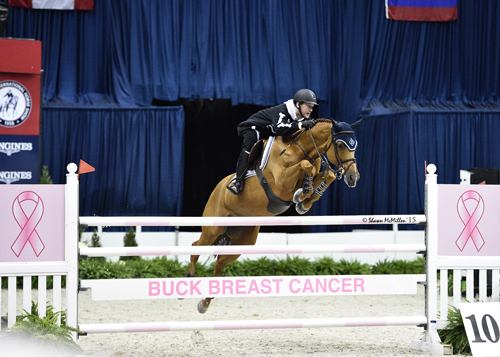 The evening session begins with a $50,000 International Jumper Speed Final, presented by Rushy Marsh Farm and AAA Equestrian, followed by the $25,000 Boeing Company International Jumper Puissance. For those who cannot make it to the show, competition will be live streamed in its entirety at www.wihs.org, and is also available on USEF Network at www.usefnetwork.com.